Keep in mind that these are overrides of the default (system-wide) billcode setting. If no site specific information has been specified for a billcode, the default characteristics will be used. Additionally, when setting up a Site Specific Override, it is not necessary to specify all available characteristics. Any that are left empty will defer to the billcode default for that characteristic. If no changes are made to the Site Based Overrides, SpecVet will handle all billcodes as before. 1. From the Home menu, click Items. 2. Locate the item you wish to modify. Then click the Billing tab. 3. Click Site Based Overrides. 4. In the first line of the portal, use the pop up menu to select the site for which you'd like to create an override. 5. 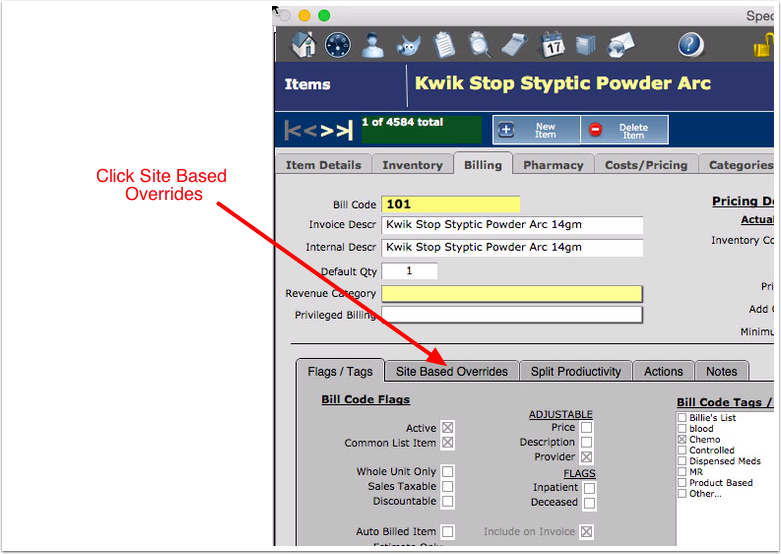 Set additional fields as necessary to specify the site overrides. It is not necessary to enter a value in every field of the portal. Only place values in the fields that need to override the default values for the billcode. To accommodate Site Base Overrides, estimates now have a site field. This field can be accessed from the Estimate Details tab on the the Estimate screen. The Site field is only visibile for non-visit estimates. If a Visit is specified for the estimate, the Site field will not show and the site is set to the site of the visit. When an estimate is created without a visit, the estimate's site is set to the user's current site. 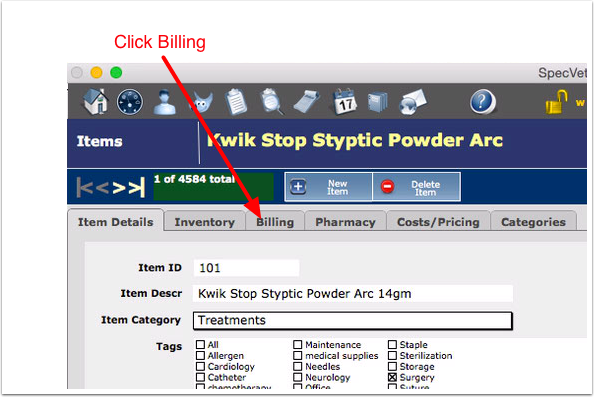 This value can be changed by either assigning the estimate to a visit or changing the site of the estimate. Changing the visit or site fields will recalculate the estimate based on site specific overrides (if any). The Invoice module works in a similar fashion to the Estimate module in that a site is assigned to the invoice base on the either the site of the visit (for visit-based invoices), or the site of the current user (for non-visit based invoices.) The site field is always visible under the Invoice Info tab of the Invoice screen. When changing the site of an invoice, only future charges are effected by the change. Any charges added to the invoice prior to the site change remain priced as appropriate under the previous value for the site field. 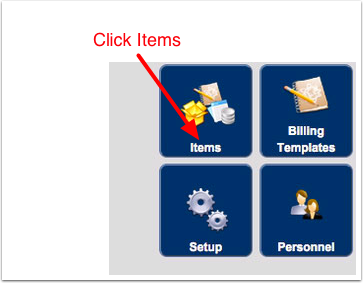 When setting up Billing Templates, the pricing that shows in the template set up screen is based upon the user's current site. However, when the templates are applied to an estimate or an invoice, the standard hierarchy applies. (See below). Site override value based on the user's current site. Next: What notes print on Estimates?